Launched in 2011, La Perla offers 27 passengers the ability to see the beauty of the Adriatic Coast from the comfort of a ship that is small enough to visit some of the Mediterranean's most exclusive ports, while still offering plenty of amenities and public areas. The ship offers a cruise director and full team of onboard staff, along with bicycles to use on shore and a private tender that can shuttle you to and from land as you wish. A swimming platform is available on the ship's stern, and water activities like water skiing, wakeboarding, fishing and snorkeling can be enjoyed when permitted. A Jacuzzi is situated on the Sun Deck for those who would rather kick back and take it easy, while bookworms and news junkies will appreciate the onboard library and included Wi-Fi internet access. 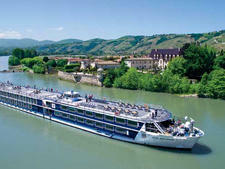 Although not exclusive to Vantage (the ship is chartered out to other companies on different departure dates), La Perla offers all the quality amenities and competitive pricing that Vantage's loyal travelers have come to expect of the company. 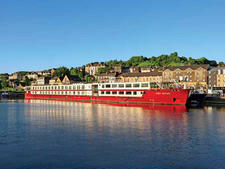 All meals aboard La Perla are served in the main dining room located on Upper Deck. Breakfasts are served buffet-style, while lunches are three-course meals served with a selection of entrees, including one vegetarian and one health-conscious option. During the evenings, four-course dinners are served up, with regionally inspired favorites. Early-riser breakfasts are served prior to the commencement of the buffet breakfast, and Vantage includes complimentary beverages aboard La Perla, such as house wine, beer, daily cocktails, soft drinks, and nonalcoholic beverages. Dietary requirements can be accommodated provided that requests are received by Vantage prior to departure. La Perla cannot, however, prepare kosher or halal cuisine. Five categories of cabins are available aboard La Perla, all of which offer ocean views. These range from 121 to 176 square feet. Categories D and E, located on Lower Deck, feature porthole windows. 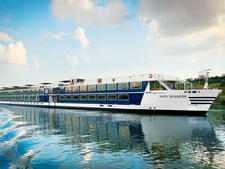 Categories A, B and C are located one deck higher on Main Deck and have their own private balconies. Lower Deck cabins have more of a nautical theme, with walls that slope with the curvature of the ship's hull. Main Deck cabins offer more personal space and small balconies. All cabins have an ensuite bathroom with hair dryer, air conditioning, LCD satellite TV with DVD player, in-house telephone, under-bed storage, large closet, desk, and sound system to hear music or announcements from the bridge. Wi-Fi internet is available onboard, but only in the ship's Lounge area. La Perla's uppermost deck is the place to be for relaxation and great scenery. A whirlpool tub is located here, along with plenty of seating in the shade and exposed areas. A Fitness Room is also located on the Sun Deck and houses a rowing machine, stationary bicycle, free weights and massage chair. There is no passenger elevator aboard La Perla. 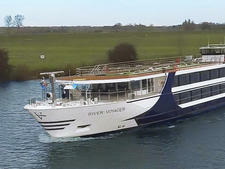 As such, the ship may not be the best choice for passengers with mobility issues. This is predominantly a "make your own fun" type of cruise, where passengers mingle and socialize with each other during the afternoons and evenings. The main lounge offers satellite TV with news and sports channels, along with destination-relevant documentaries. La Perla is primarily an adult experience. No amenities or provisions are made onboard for families. Vantage caters to a more mature audience, and families with children or teenagers will find themselves out of place aboard La Perla. 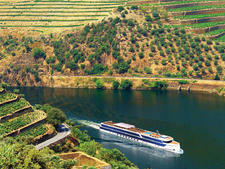 La Perla sails two separate itineraries for Vantage: the 14-day Croatia and Pearls of the Adriatic Coast that runs from Dubrovnik to Zagreb; and the 12-day Croatia Seasonal Splendor that operates round trip from Zagreb.